Everything in Egypt seems to be on an impossibly grand scale – history spanning thousands of years, majestic temples, gigantic monuments and vast deserts. Flowing through the centre is its eternal lifeblood, the mighty Nile. Visit the Great Pyramids of Giza and stand in awe before the staggering façade of the Temples of Ramses II and Queen Nefertari at Abu Simbel. Learn about more recent history at the World War II memorials in El Alamein and relax on the shores of the sparkling Red Sea. Your journey into wonder begins at Giza with a three night Special Stay at your iconic hotel with views of the Great Pyramids from your balcony. Be amazed by the magnitude of the Pyramids and visit the Solar Boat Museum housing the restored cedar wood barge dating back to 2500BC. Marvel at the 20 metre limestone monolith of the Sphinx. This evening watch the laser light display and entertaining show at the Pyramids. Visit the site of one of World War II’s defining battles, El Alamein or visit the ancient sites of Saqqara and Memphis. Tonight enjoy a barbeque dinner at 139 Terrace. Fly early to Abu Simbel and visit one of Egypt’s most magnificent monuments, the enormous World Heritage-listed temples of Ramses II and his wife Nefertari, rescued from the rising waters of the Aswan Dam. Fly to Aswan where you will be ensconced in luxury during your two night Special Stay and admire the views over the Nile from the comfort of your balcony. Visit a Nubian village or the beautiful but often-overlooked Kalabsha Temple on the shores of Lake Nasser. Alternatively, take a motorboat ride to the upper reaches of the Nile and explore the Botanical Gardens. Embark on your luxurious private charter on board the boutique Sanctuary Sun Boat III and settle into your elegantly appointed cabin. Discover the granite quarries of ancient Egypt, learn about ancient carving techniques and see the enormous unfinished obelisk. Later, enjoy traditional felucca cruise on the Nile. Toast the start of your Nile cruise and enjoy a display of Nubian dancing. Discover the Osiris temple complex of Philae, then follow the course of the ancient pharaohs’ processions along the Nile as you cruise north. Explore Kom Ombo temple, perched high on the east bank. A fun night awaits on board with a colourful Galabeyya party with Egyptian delicacies, music and dancing. Cross to the West Bank of the Nile and admire the colourful hieroglyphics adorning the tombs in the Valley of the Kings. See the impressive monument to Queen Hatshepsut and the well-preserved temple of Ramses III. At the vast temple complex of Karnak marvel at the enormous pillars as you walk through the impressive Hypostyle Hall. Tonight join the Captain and crew for a farewell Gala Dinner. Disembark and join a walking tour through the local produce markets. Later, relax in the beautiful gardens of your overnight Special Stay in luxury rooms overlooking the gardens. Late this afternoon discover the fascinating antiquities housed in the Luxor Museum followed by the treasures of Luxor Temple. Balloon Flight - Choose to add an optional hot air balloon flight. Additional cost, please book on tour. Relax in the gardens of the hotel and enjoy a barbeque dinner Egyptian style. Travel to the temple complex of Dendera and marvel at the vibrant colours of the hieroglyphics adorning the roof of Hathor’s temple. Drive through the desert moonscape to reach your luxurious resort, the Kempinski Soma Bay, set on the shores of the Red Sea. Relax and enjoy a day at leisure on the sparkling shores of the Red Sea. Your resort features a daily activity program or you can just relax pool or beachside. Raise your glass as you watch the play of colours across the dramatic desert and sea landscapes. 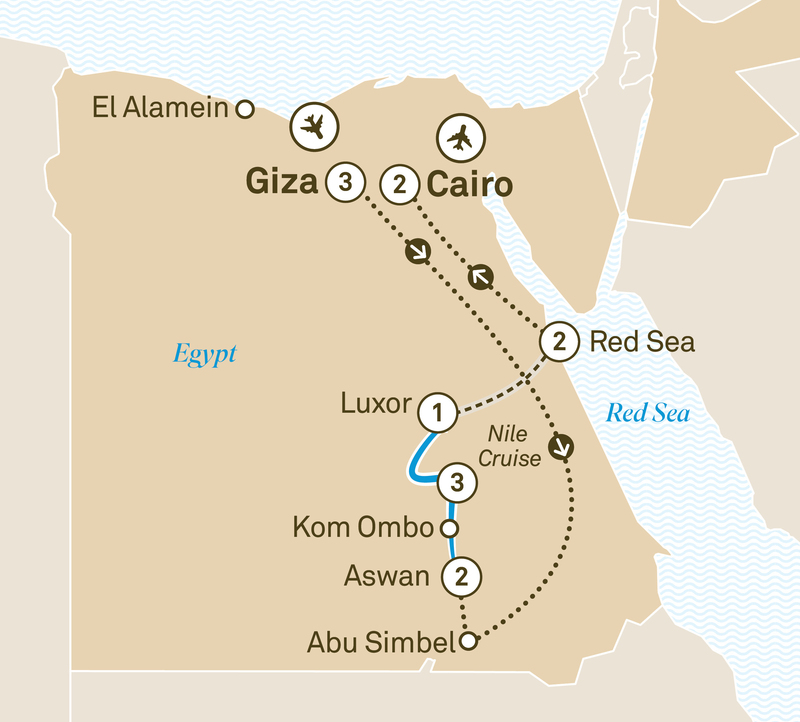 This morning is at your leisure before flying to Cairo for your two night stay. Discover Islamic Cairo and Khan el Khalili Bazaar or explore Old Cairo and the Hanging Temple of Babylon. Alternatively, visit the old Egyptian Museum and see the collection of Royal Mummies. Tonight join your Tour Director for a farewell to Egypt dinner.